I was going to just follow up my initial post from two years ago but the topic isn't really the same. Here's what I've tried if anyone has any further recommendations. Bolzano, PermaSharp, and GSB were all terrible for me. All painful, the Bolzano less so. The GSB basically felt old and rusty after 2 shaves, just terrible. Permasharp cut me, Bolzano tugged the whole time. I have thick facial hair and really sensitive skin. Polsilver SI is the only thing I've found that I can shave, even badly every now and then in a rush, and still not cut myself. Isn't there a way to determine that Polsilver SI are a 'type X' blade and therefore I just need to find another 'type X' manufacturer? Or maybe, like Razor Emporium tries to do, there is a scale of sharper to less sharp blades so that I can find a less aggressive blade that will let me do the three passes I usually need to get a good clean shave? What's the recommendation here, to get a MORE aggressive blade for these three passes so that they are clean and get at those tough hairs with less work? Or a less aggressive blade so that when I get to my third pass I'm not destroying my face. For reference, as I said Polsilver gets me through three passes with, at worst, a little irritation. I used to use Feather before that which was basically a roulette table of no logic dictating when I'd completely irritate my face and when I wouldn't. It seemed out of my hands or rather SO much in my hands that I needed to be careful of every single swipe of the blade to not cause irritation. Obviously, they weren't for me. 1) what kind of water you have? soft, hard? 2) what soap/cream do you use? 3) what is your pre-shave face prep? brush prep? soap prep? 4) what razor do you use? Good questions. I’d also ask, how long between shaves? 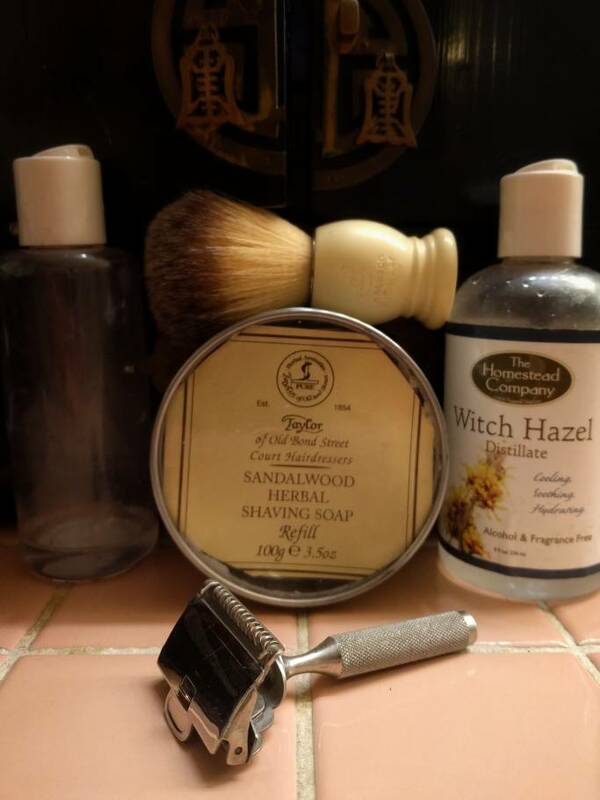 @tinpanalley, the sharpest blades I’ve tried are Personna Med Prep, Kai and Feather. 1. Neither soft nor hard, in between. I have to shave every two days if I don't want thick stubble. - a good 2 minute lather up to the right consistency in my bowl ok...do you work the lather in your beard? - cold water face rinse to start hmmm...really? If DE blades aren’t working, get a SE razor. They use thicker blades, which work better on coarse hair and sensitive skin. The best blades I’ve used are the japenese twin injector blades from the bay, used with a schick o clone provides great shaves with ease. Also, I soak my brush in a mug with distilled water. Soaking my brush in soft water was the key to my great shaves. (05-17-2018, 02:10 PM)SweetReason Wrote: If DE blades aren’t working, get a SE razor. They use thicker blades, which work better on coarse hair and sensitive skin. I would agree, a modern single edge like the Blackland Sabre would be a good option to try. As far as DE blades, I find the Kai's to be the best balance between sharp and smooth. Just remember, NO PRESSURE during the shave. Refinedshave dot com does objective sharpness testing and I trust their tests over user reviews. When we say SE we don't mean straight razor, right? Different thing altogether? (05-17-2018, 07:43 PM)tinpanalley Wrote: When we say SE we don't mean straight razor, right? Different thing altogether? Single Edge . Different thing. (05-17-2018, 07:54 PM)jmudrick Wrote: Single Edge . Different thing. Ok, then I have reading to do. Of the Single Edge razors, their are gem razors such as the gem 1912 and the micromatic clog pruf that take gem ptfe blades. Injector razors such as the schick g and schick i injectors that take schick injector blades that come in yellow packs of 7 blades. Then there’s schick L injector and schick O injector that take the japenese twin injector blades found on bay. I recommend the razors that use the japenese twin blades because they last 30+ shave and I’ve yet to have a bad shave with them. Once I discovered single edge razors, I’ve been selling off all my DE razors. An excellent razor, but might be too aggressive for someone who is have problems with shave comfort. Maybe a Mongoose or similar that is a milder shaver might be a good place to start with the Feather Artist Club blades. What is there in vintage razors like the Gillette Slim and Fatboy adjustable? Do SE razors come in adjustable styles? Lots of good advice so far, but also what setting do you set the Slim at? Another idea is go to tryablade.com get a couple or three of a few different ones and try them out. Lastly, you may just need to stick with what works. The PSI's.